The traditional observance of October as the month of the Holy Rosary begins, of course, with the Battle of Lepanto in 1571, and the institution of the feast of the Holy Rosary, also called the feast of Our Lady of Victory. Two years later, at the request of the Dominican Order, Pope Gregory XIII (1572-85) granted the feast to all churches which had an altar of the Rosary. After another important victory against the Ottoman Turks, the Battle of Peterwardein in 1716, Clement XI (1700-21) extended the feast to the entire Roman Rite. In accordance with the common custom of the time, it was originally fixed to the first Sunday of October, regardless of the date; partly because the victory at Lepanto was on the first Sunday of October, partly because, with the continual reduction of the number of holy days of obligation, feasts were often fixed to Sunday so that they might be kept with greater solemnity by the people. The custom of permanently fixing feasts to particular Sundays was abolished by Pope St Pius X as part of the breviary reform of 1911, and the feast of the Holy Rosary then assigned to the calendar date of Lepanto, October 7. 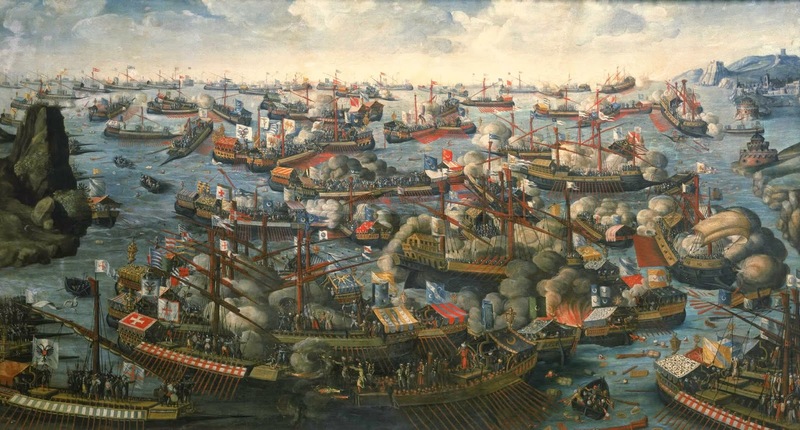 The Battle of Lepanto, by an unknown artist, late 16th century, now in the National Maritime Museum in Greenwich, England. Once October had been well established as a Marian month, two other feasts were then created for the second and third Sundays of October, called the feasts of the Maternity and of the Purity of the Virgin Mary. Of these two, the former gradually grew in popularity, to the point where the 1911 edition of the Catholic Encyclopedia says, “At present the feast is not found in the universal calendar of the Church, but nearly all diocesan calendars have adopted it.” The latter was at least popular enough to be routinely found in the appendix “for certain places” of most editions of the Roman Missal and Breviary printed in the later 19th and early 20th centuries. In 1931, Pope Pius XI extended the feast of the Virgin’s Maternity to the universal calendar, assigning it to October 11th, which was then the first free day of the month. A breviary lesson was added to the feast, which explains that the Pope intended it to serve as a liturgical commemoration of the 15th centenary of the Ecumenical Council of Ephesus. The third Ecumenical council was held in that city in 431 to refute the heresy of Nestorius, Patriarch of Constantinople, by which he rejected the liturgical use of the title “Mother of God” for the Virgin Mary. Shortly thereafter, Pope Sixtus III (432-40) built the basilica of Saint Mary Major in Rome, the oldest church in the world dedicated to the Mother of God, which still preserves a famous mosaic with episodes of Her life on the arch over the altar. 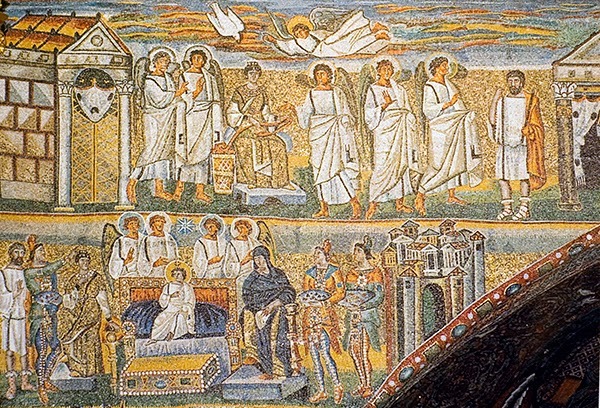 Pope Pius XI also notes in this lesson that had arranged for extensive restorations of the basilica, “a noble monument of the proclamation of Ephesus,” and particularly the mosaic. The upper left section of the mosaic on the triumphal arch of Saint Mary Major, with the Annunciation above and the Adoration of the Magi below. To the right of the Annunciation, the angel comes to reassure St Joseph. In the Adoration of the Magi, Christ is shown as a young child, but not as an infant, since the Gospel of St Matthew does not say how long after the Birth of Christ the Magi came to Him. October 11 was then set by Pope St John XXIII as the opening day of the Second Vatican Council in 1962. Pope John had a great devotion to Pope Pius IX, who was not yet a Blessed in his time, and whom he very much wished to canonize. Pius IX had proclaimed the dogmatic definition of the Immaculate Conception in 1854, and fifteen years later, set the feast of the Immaculate Conception as the day for the opening of Vatican I. As Bl. Pius had placed his council under the protection of the Mother of God by opening it on one of her feast days, so did St John, the feast in question being also a commemoration of yet another ecumenical Council, and one especially associated with the Church’s devotion to the Virgin. The crest of Pope St John XXIII, in the atrium of St Peter’s Basilica; the opening date of Vatican II is written beneath it, without reference to the feast of the Maternity of the Virgin Mary. In the post-Conciliar liturgical reform, the feast of the Maternity of the Virgin Mary was suppressed, on the grounds that the newly-created Solemnity of Mary, Mother of God, on January 1st made it superfluous, another fine example of the law of unintended consequences. The offical account of the changes made to the calendar, published by the Vatican Polyglot Press in 1969, explains this new feast in reference to the “Synaxis of the Mother of God” which the Byzantine Rite keeps on December 26th. But in point of the fact, the latter observance arises from a particular Byzantine custom, by which several major feasts are followed by the commemoration of a sacred person who figures prominently in the feast, but who is, so to speak, overshadowed by another. These are usually, but not invariably, called “σύναξις (synaxis)” in Greek, “собóръ (sobor)” in Church Slavonic; that of St John the Baptist is kept on January 7th, the day after the Baptism of the Lord, that of St Gabriel the day after the Annunciation, that of the Twelve Apostles after Ss Peter and Paul, and that of Ss Joachim and Anne, the Virgin’s parents, on the day after Her Nativity. These are not the principal feasts of the persons honored by these “synaxes”, and one also finds in the Byzantine Calendar the feasts of St John on June 24 and August 29, of St Gabriel on June 11, the Apostles each on their own day (rarely the same as in the Roman Rite), and St Anne on July 26. September 9th is also kept by the Byzantines as the commemoration of the “Fathers of the Third Ecumenical Council at Ephesus”; a most appropriate choice, since the liturgical New Year of the Byzantine Rite is on September 1st, and the Nativity of the Virgin is therefore the first Marian feast of the year. And indeed, the Maternity of the Virgin Mary would be better described, despite its title, as a Roman version of this Byzantine feast of the Fathers at Ephesus. The Byzantine Rite also has similar commemorations of the Fathers of the other ecumenical councils, as well as a joint commemoration of those of the first six, and another of Second Nicea. An icon of the “Synod of the Holy Fathers”, in which the Emperor Constantine holds a scroll with the opening words of the Nicene Creed in Greek. Pope St John XXIII died on June 3, 1963, a day which at the time had no feast on the General Calendar, but in the Novus Ordo was made the feast of the Ugandan Martyrs canonized in 1964. Despite the oft-stated modern preference for keeping Saints’ feasts on the anniversary of their death, or as near to it as possible, his feast day was assigned at the time of his beatification, for those places which kept it, to the anniversary of the opening of Vatican II. His feast and that of St John Paul II were extended to the general calendar as optional memorials in 2014; the latter is assigned to October 22, the day of his inauguration as Pope in 1978, since the day of his death, April 2, is very often impeded by Holy Week or Easter week.